James St, Northcote – Northcote Police Stn. At approximately 2.20am on Saturday 20th May, 2000 Senior Constable Robinson and Senior Constable Mark Bateman were travelling along High Street, Northcote with emergency lights activated in response to an emergency call. At the intersection of Dennis & High Streets the divisional van they were driving collided with another vehicle before coming to rest against a traffic control signal and electricity pole. Both members were killed instantly. Today the Victoria Police Blue Ribbon Foundation will dedicate a Police Memorial to honour Senior Constable Fiona ROBINSON at the Geelong Hospital. The ceremony, to dedicate the Fiona Robinson Treatment Room in the Children’s Ward, is to be conducted in the presence of senior police, representatives from the hospital and the Blue Ribbon Foundation plus members of Senior Constable Robinson’s family. Many of S/C Robinson’s former colleagues, who were stationed at Northcote in May 2000, will also be attending. The Victoria Police Blue Ribbon Foundation has donated $250,000 for the specialised Treatment Room at Geelong Hospital with nearly half being raised in the Geelong community. The Fiona Robinson Treatment Room forms part of the recently redeveloped children’s area of the Geelong Hospital where more than $8 million was raised to create the Cotton On Foundation Children’s Ward. Fiona’s Treatment Room is specially equipped to give primary care and treatment to children as well as new-born babies and their mothers. 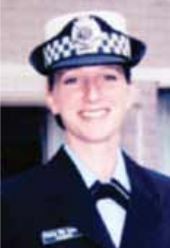 Fiona Robinson completed her training at the Police Academy and graduated as Constable Fiona De Leuuw (30507) on 17th February, 1995. Her initial posting was at Mill Park police station before transferring to Transit in April, 1997. In March 1999 she was posted to the Uniform Division at Northcote and earned her promotion to Senior Constable in August the same year. In early 2000 Fiona married Trevor Robinson but this happy union was cut short by tragedy, just three months later. At approximately 2.20am on Saturday 20th May, 2000 Senior Constable Robinson and Senior Constable Mark Bateman were travelling along High Street, Northcote with emergency lights activated in response to an emergency call. At the intersection of Dennis & High Streets the divisional van they were driving collided with another vehicle before coming to rest against a traffic control signal and electricity pole. Both members were killed instantly. Fiona was 30 years of age. Fiona DeLeeuw was an energetic, happy young girl that spent much of her childhood living around the Romsey area with mother Shirley, father Ernie and her two brothers Andrew & Matthew. Ernie was a member of Victoria Police for 27 years and became the first Sergeant to be stationed at Wallan. 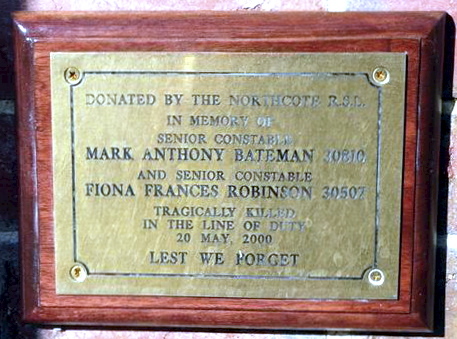 A posthumous Victoria Police Star was awarded to Constable Robinson’s family on 19th July, 2005. The Victoria Police Blue Ribbon Foundation is a community-based organisation that perpetuates the memory of fallen police officers through the support of worthwhile community projects within Victoria. The dedication of this latest facility will bring to 29 the number of hospital units funded by the Foundation in Victoria, mostly in the areas of emergency and trauma treatment. “Senior Constable Robinson died while answering an emergency call from a member of the public and she paid the ultimate price. Our view is that members who have fallen in the line of duty shall forever remain on duty and now, through this specialised Treatment Room, Senior Constable Robinson is serving the people of Geelong”. A coroner has found the deaths of two policemen in a car accident in Melbourne were not influenced by the van in which they were travelling. Senior Constable MARK BATEMAN, aged 30, and 31-year-old Senior Constable FIONA ROBINSON died from multiple injuries after their divisional van rolled when it side-swiped another car in suburban Northcote on May 20 last year. Coroner PHILLIP GOLDBERG said the two police officers were en route to a burglary in progress and were trying to overtake the slower moving car. He said a subsequent police investigation revealed that the Holden Commodore in which they were travelling had a higher potential to roll over than the previous model Ford. The Commodore divisional vans are no longer used by police. But Mr GOLDBERG says the Commodore’s greater risk of rolling did not aggravate the circumstances of the two police officers deaths. Trevor Robinson stood before about 150 people and declared that for the rest of his life he would love the wife he lost in tragic circumstances 10 years earlier. At the same time, he told of his love for Tina Robinson, whom he has since married, and the two daughters they have together. were killed in a divisional van accident as they were heading to a reported holdup. Crewman vehicle, which was designed to reduce the risk of rolling over. In September last year, the government announced that new vans, each featuring six airbags and an Electronic Stability Program, are being introduced in a phased rollout that will replace the Crewman vehicles. recalled the night she had “a visit from the police that a police family truly dreads”. She had a two-year old son, Jack, and a baby daughter, Daisy. Trevor and Fiona Robinson had been married only three months. Deb told how in 10 years, Jack has enjoyed school success, Daisy shines in basketball and she herself has completed a PhD. Life has gone on, she said, even as they continue to miss Mark. anniversary of the tragedy, is an example of Deb’s assertion that the police community has never deserted her and her family. Police Legacy organised a Perth holiday for the children last year. They have flown in a police helicopter with the Chief Commissioner thanks to the Blue Ribbon Foundation. police organisations that keep us connected,” said Deb. Officers at the tightly knit Northcote police station in Melbourne’s inner north are today mourning the deaths of two of their colleagues in a road accident early yesterday. Senior Constable Mark Bateman, 30, and his 31-year-old friend and colleague Senior Constable Fiona Robinson who was married just 11 weeks ago were killed when their divisional van hit a pole after colliding with a car in High Street, Northcote, about 2.20am. One of the- two officers was believed to have swapped a shift with a colleague and was not originally rostered to work on Friday night. Acting Chief Commissioner Neil O’Loughlin said he was deeply saddened by the accident, which highlighted the dangers police faced. “It’s tragic that these members died whilst serving the community,” he said. Senior Constable Bateman was also married, with a two-year-old son, Jack, and a daughter, Daisy, three months. “Mark loved work and was dedicated to his family,” Senior Sergeant McIntosh said. Police spokesman Kevin Loomes said the 40 officers stationed at Northcote were receiving counselling. He said some of them had arrived at work yesterday unaware their friends had been killed. Yesterday, Northcote residents and police paid their respects by dropping flowers off at the police station. Bunches of flowers were also taped to a pole at the accident scene. Mr Loomes said the accident occurred while the two officers were driving north along High St.